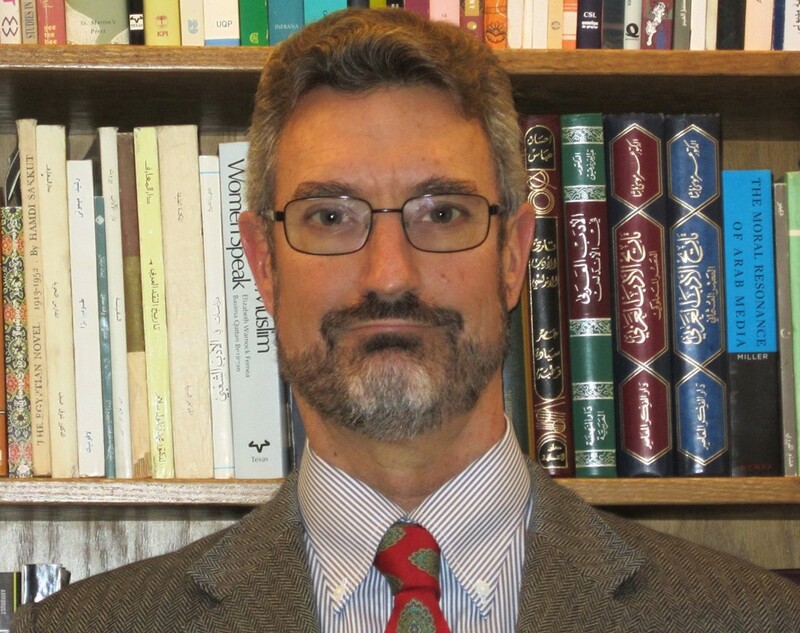 Dwight Reynolds is Professor of Arabic Language & Literature in the Department of Religious Studies at the University of California in Santa Barbara. The Cambridge Companion to Modern Arab Culture. Editor and co-author. Cambridge: Cambridge University Press, 2015. Tarjamat al-nafs: al-sīra al-dhātiyya fī al-adab al-‘arabī. Trs. Sa‘īd al-Ghānimī. Abu Dhabi: Hay’at Abū Dhabī li-l-Thaqāfa wa-l-Turāth [Arabic translation of Interpreting the Self: Autobiography in the Arabic Literary Tradition, UC Press 2001], 2009. Interpreting the Self: Autobiography in the Arabic Literary Tradition. Dwight F. Reynolds, editor and co-author. Berkeley/Los Angeles: University of California Press, 2001. Heroic Poets, Poetic Heroes: The Ethnography of Performance in an Arabic Oral Epic Tradition. Ithaca: Cornell University Press, 1995. “Music, Poetry, and Lingua Franca in Medieval Iberia.” In Lingua Franca: Explorations of the Literary Geography of the Mediterranean World, ed. Michael Allan and Elisabetta Benigni. (Philological Encounters 2, 2017): 76-94. “Song and Punishment.” In Arabic Humanities, Islamic Thought: a Festschrift for Everett K. Rowson. Eds. Shawkat Toorawa and Joseph Lowry. Leiden: E. J. Brill, 2017: 211-232. “Ziryab in the Aghlabid Court.” In The Aghlabids and their Neighbors: Art and Material Culture in 9th-century North Africa. E. J. Brill Arts and Archaeology of the Islamic World series: 144-162. “The Qiyan of al-Andalus.” In Concubines and Courtesans: Women and Slavery in Islamic History Eds. Matthew S. Gordon and Kathryn Hain. Oxford: Oxford University Press, 2017: 100-123. “From Basmati Rice to the Bani Hilal: Digital Archives and Public Humanities.” In Digital Humanities and Islamic & Middle East Studies. Ed. Elias Muhanna. De Gruyter: 2016, pp. 251-268. “Jews, Muslims, Christians and the Formation of Andalusian Music.” In Musical Exodus: Al-Andalus and Its Jewish Diasporas. Ed. Ruth Davis. NY/London: Rowman & Littlefield, 2015: 1-24. “Andalusian Classical Music.” In The Other Classical Musics. Ed. Michael Church. London: Boydell and Brewer, 2015: 246-269. “Modern Arab Culture: Introductory Remarks.” In Cambridge Companion to Modern Arab Culture. Ed. Dwight F. Reynolds. Cambridge: Cambridge University Press, 2015: 1-18. “Folklore.” In Cambridge Companion to Modern Arab Culture. Ed. Dwight F. Reynolds. Cambridge: Cambridge University Press, 2015: 249-67. Resources for the Study of Oral Traditions, 28/2 (2013): 271-78. “Lost Virgins Found: The Arabic Songbook Genre and an Early North African Exemplar.” Quaderni di Studi Arabi Special Issue: Words and Music. Eds. Hilary Kilpatrick and Giovanni Canova, N.S. 7 (2012): 69-105 . “Arab Musical Influence on Europe: A Reassessment.” In A Sea of Languages: Literature and Culture in the Pre-Modern Mediterranean. Eds. Suzanne Akbari and Karla Mallette. University of Toronto Press, 2013, pp. 182-98. “Epic and History in the Arabic Tradition.” In Epic and History. Eds. David Konstan and Kurt A. Raaflaub. Chichester, West Sussex: Wiley-Blackwell, 2010: 392-410. “New Directions in the Study of Medieval Andalusi Music.” Journal of Medieval Iberian Studies, Vol. 1, no. 1 (2009): 37-51. “Al-Maqqarī’s Ziryāb: The Making of a Myth.” Middle Eastern Literatures, Vol. 11, no. 2 (2008): 155-168. Special issue, ed. Shawkat Toorawa. “Musical Aspects of Ibn Sanā’ al-Mulk’s Dār al-Ṭirāz.” In Muwashshah: Proceedings of the Conference on Arabic and Hebrew Strophic Poetry and its Romance Parallels, October 8-10, 2004, School of Oriental and Asian Studies, University of London: 211-227. The Cambridge History of Arabic Literature: the Post-Classical Period, Section Editor (Part IV: Popular Prose) & Contributing Author (pp. 245-69, 270-91, 307-18). Cambridge: Cambridge University Press, 2006. “Symbolic Narratives of Self: Dreams in Medieval Arabic Autobiography.” In Defining Fiction and Adab in Medieval Arabic Literature, ed. Philip Kennedy. Studies in Arabic Language and Literature, Harrassowitz Verlag, Volume 7: 259-284, 2005. “La Música Andalusí como Patrimonio Cultural Circum-Mediterráneo.” In El patrimonio cultural, multiculturalidad y gestión de la diversidad [Cultural Patrimony, Multiculturalism, and the Management of Diversity], 128-141. Eds. Gunther Dietz and Gema Carrera. Sevilla: Instituto Andaluz del Patrimonio Histórico, 2005. “Creating an Epic: From Apprenticeship to Publication,” in Textualization of Oral Epics, ed. Lauri Honko. Berlin/New York: Mouton de Gruyter. Pp.247-262, 2000. “Music,” in Cambridge History of Arabic Literature, The Literature of Al-Andalus. Cambridge: Cambridge University Press, pp. 60-82, 2000. “Musical ‘Membrances of Medieval Muslim Spain. '” In Charting Memory: Recalling Medieval Spain, ed. Stacy Beckwith. New York: Garland, pp. 155-168, 2000.